As I go through this binder and series, one thing will be apparent - bodies. 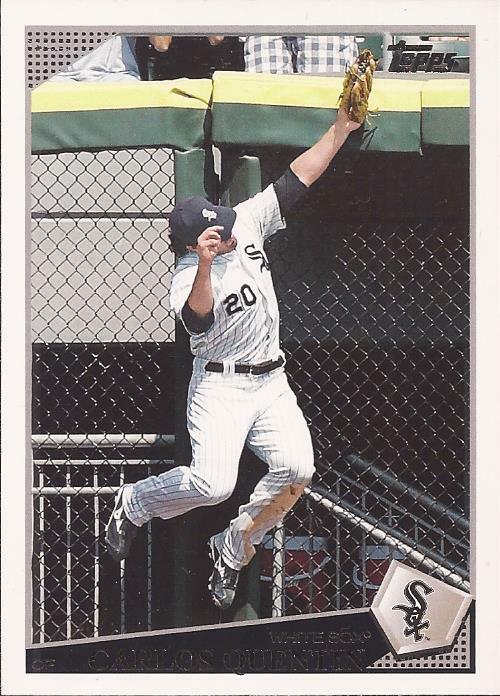 In recent years, Topps has been zooming in on images they use to create the cards. I think I understand why - the focus is the player. While there are less portraits than have been on vintage cards, this return is not beneficial or positive, in my book. Action cards are where it's at. Prime example is player hated by all Dodger fans Carlos Quentin. Sure, Topps could have zoomed in more, but someone was wise enough to realize you can get everything you need by showing everything there is. Full body crashing into the wall, the hint of white from the pocket of the beige glove, the fencing, the top of the wall - all of it together makes the entire image. We know who the player is - it's right there on the front in foil we can't read. We don't need to see his face because there are enough identifying information to know this is Carlos Quentin. Bonus points for not messing with the contrast. The latest deal with Topps running images through a filter to to bring out each fold of a uniform is overused. The stark white of the top of his pants work well with the shadowed torso and lower legs. Electric Light Orchestra is one of my favorite bands. From Eldorado to New World Record to Discovery, I've owned a bunch of their albums. And say what you want about Xanadu, it's still a guilty pleasure. In 1977, they release the double album Out Of The Blue. Filled with hits like Turn To Stone, It's Over, Sweet Talking Woman, it was their best selling album. Side 3 (side A of album 2) is a 4 part piece called Concerto For A Rainy Day. Most famous song from that side, used in dozens of movies, is the last song - Mr. Blue Sky. But the best song, in my opinion, is the first song from the piece, Standing In The Rain. It's a well written piece that hits you hard with a bevy of instruments and melodies, and its' staccato rhythm mimics that of a thunderstorm, which is pretty much it's intention. It's ebbs through it's 4 minutes and flows into the next track, Big Wheels. If you haven't heard the entire piece, give it a listen here. ELO is always a good spin - what do you think about the new(ish) single "When I Was a Boy?" Of course, it's basically a Jeff Lynne solo project, but I think it's pretty good as far as new classic rock band songs go. 2009 was a good set because the photos were real photos. Have owned 8 of ELO's albums since I was 14. Did a whole post on Out of the Blue. http://nightowlcards.blogspot.com/2015/02/match-song-title-out-of-blue.html. And, yes, Quentin, we still hate you. You always have to be different, don't you?